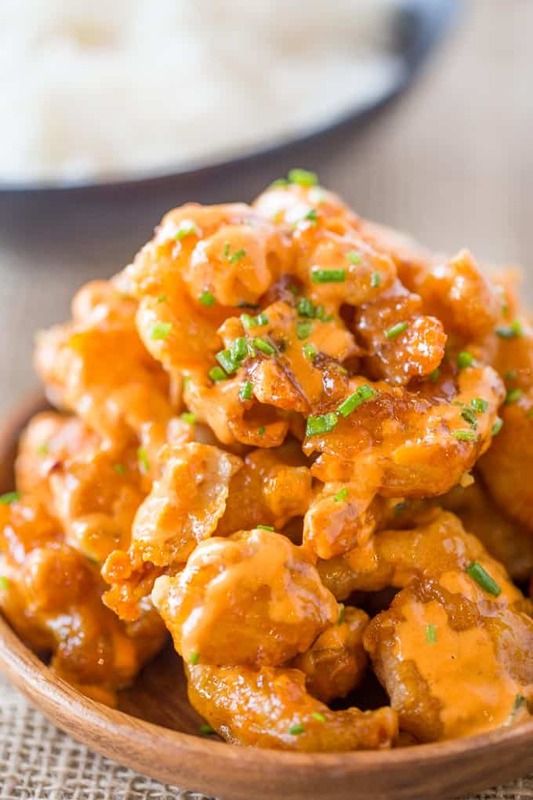 Bonefish Grill Bang Bang Shrimp is a recipe that in no way is authentic to another cuisine, but it is definitely a delicious appetizer and hands down the most popular item on the menu. When we go to the Bonefish Grill we actually order two of these appetizers to prevent fighting over them. 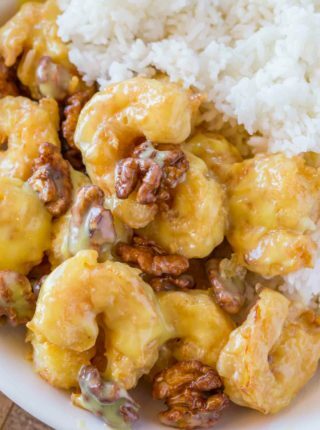 It actually reminds me of the Panda Express Crispy Honey Shrimp with Walnuts entree I did a recipe for last year. The main ingredients at play here are mayo, a very specific Thai Sweet Chili Sauce and Sriracha. 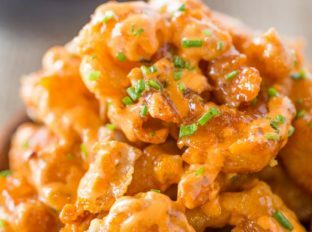 I’ve read countless versions of the recipes online for this Bang Bang Shrimp and came across a post where a reader said he worked for the chain and that they would soak the shrimp in buttermilk before breading. This made total sense to me because most of the recipes I’d seen didn’t have enough body in the coating to be like the original. I’d also caution you to use the right brand of sweet chili sauce as that is authentic to the recipe as well. A friend who used to work at the restaurant confirmed the brand of sweet chili sauce used in the recipe. Looking for more Asian Food? 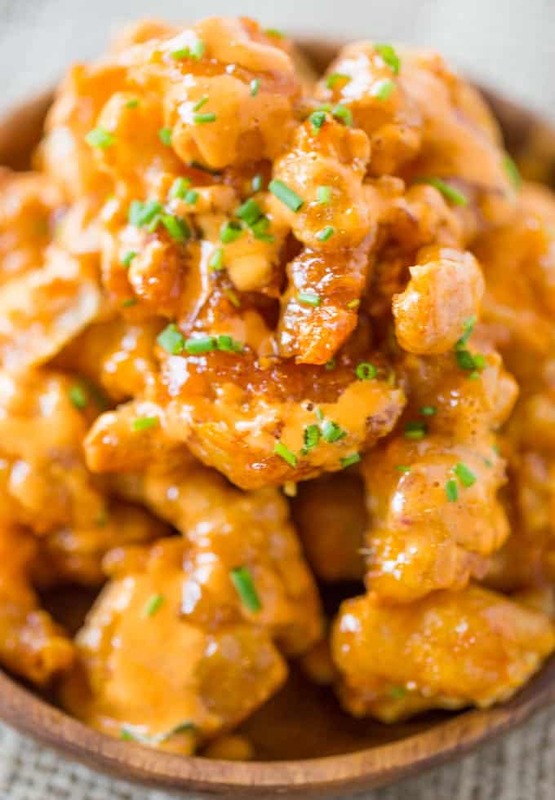 Thai Sweet Chili Sauce: The authentic sauce used in the Bonefish Grill kitchen, if you don’t want to order it online, it is widely distributed in Asian grocery stores. Sriracha: The king of chili garlic sauces, always keep this in your kitchen. Dutch Oven: Perfect for deep frying, inexpensive pot and will last you for years. Shrimp Deveiner: If you love cooking with shrimp you will love this tool, it makes cleaning shrimp a hundred times easier! 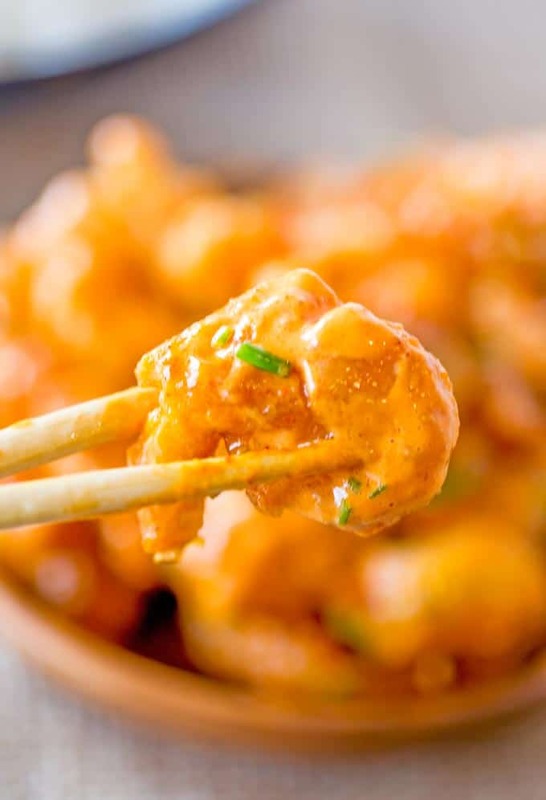 In a small bowl add the mayonnaise, Thai sweet chili sauce and Sriracha and stir. In a second bowl add the shrimp and buttermilk and stir to coat all the shrimp. Remove from the buttermilk and let excess liquid drain away. 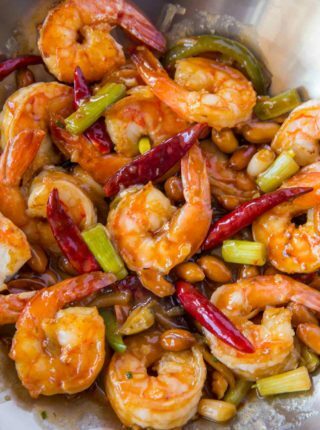 Coat the shrimp in cornstarch. 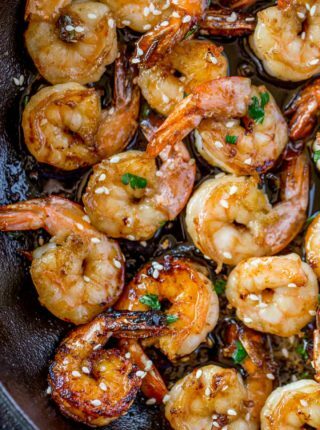 Fry the shrimp until lightly brown, 1-2 minutes on each side. 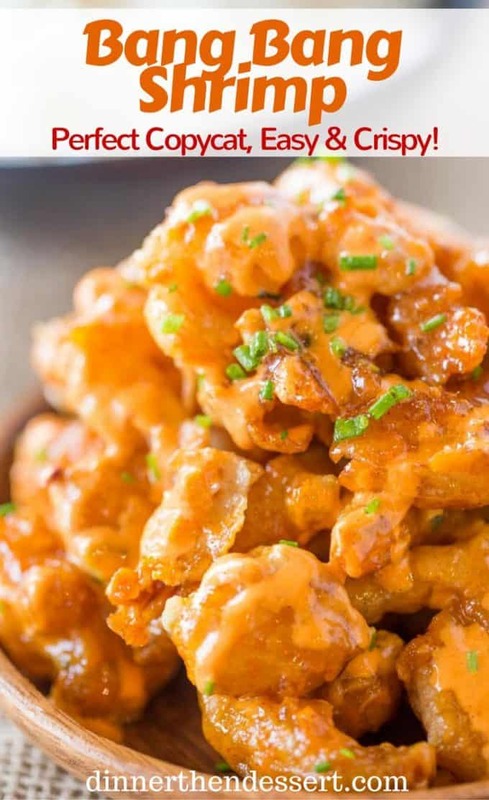 Once fried coat with the sauce and serve immediately. This recipe is fantastic! Just cooked it for my wife and she is impressed. Thank you! Way too much mayo! Ugh. Will more than cut that in half and add a bit more Sriracha if I try it again. I made about 3 lbs of this recipe. Tasted great…5 Stars!!! I did have to change the sauce up a bit. Mayo was over powering it, so I added more of the Thai sauce and 3x the Sriacha. When they were coated, I put them under a lo broil to crisp up a bit more. Fabulous!! So glad you were able to adjust to your liking and that you loved it! It is super good!! Maybe even better than the bang bang shrimp from Bonefish. But it is not the same. It packs a little bit of heat in the end which I love but its not the same sorry! The Keys are one of my favorite places on Earth and these shrimp are so spot on and remind me of bonefish grill every time!!! 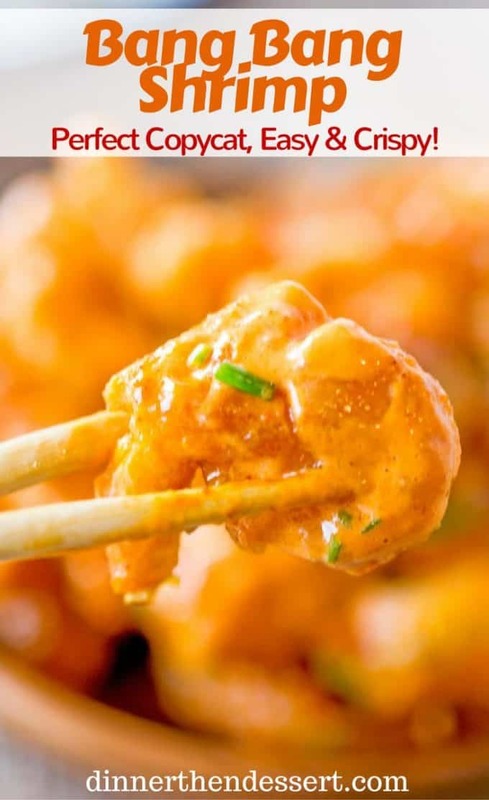 I am very confused how all these people find this recipe “a copy of the Bang-Bang shrimp”. I literally read ALL the comments before trying to make them myself. (We love the Bonefish shrimp so much that we drive 45 min each way just for them! So, we basically can’t live without them). 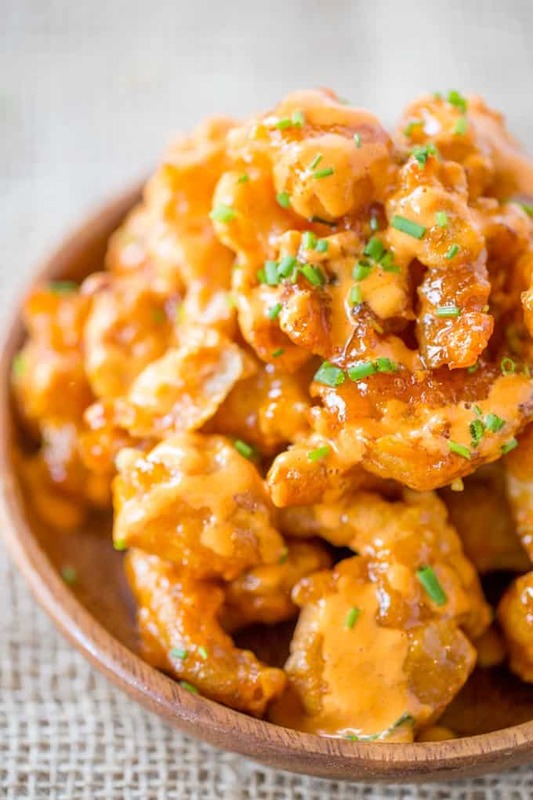 But the sauce in this recipe is not even close – it’s too sweet and not hot at all. After making the given recipe, I tried to tweak it a little bit by adding some lemon juice and more Sriracha. The Thai SWEET chili sauce is overpowering the other two ingredients. I am sorry, but this is not the same dish. 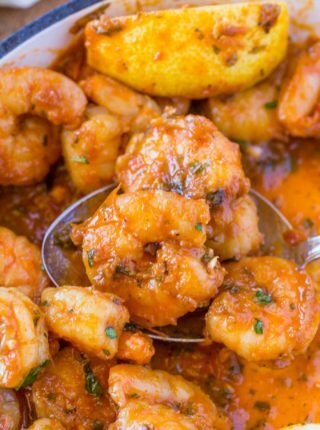 Can the shrimp be done in an air fryer? I’ve never tried it so I can’t really say. If you decide to try it, I’d love to know how it turns out. Thanks! I used to have a Bonefish Grill nearby, but now the closest one is over 3 hours away. 🙁 I was feeling lazy so I bought frozen popcorn shrimp and baked them in the oven. Then I made the sauce using your recipe. I tossed the cooked shrimp in the sauce and put back them back in the oven just to get crispy. SO delicious!!! The sauce is spot-on! So glad you loved it, Lydia! Recipe sounds amazing! However out of curiosity am I able to use something else instead of buttercream? I really hope you enjoy it! I’ve not tested it before but you might be able to substitute the buttermilk for yogurt. It won’t be a copycat but it might still work. 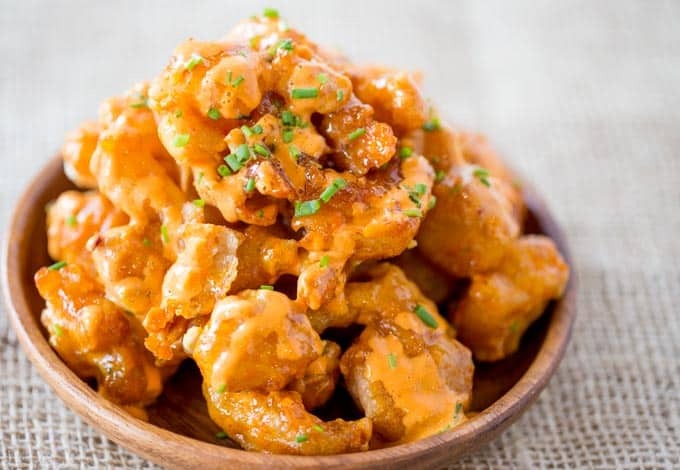 This is a 5 star bang bang shrimp. I had to make it for my fiance two days in a row it was that good. Thanks for the recipe. We just made this. Overall, it was okay. Too much mayo and not enough spice. I tried adding lemon juice and more siracha which made it a little better. This recipe is to die for! I have made it for company and it is always a hit. I do take a short cut and buy siracha mayo. I actually use the sauce on chicken and sandwiches. Highly recommend!!! Love the shortcut idea too! We all deserve a little help in the kitchen every now and then!! So glad you love it! Instead of deep frying can I use an air-fryer with the same results? I haven’t tested it so I’m not sure. If you decide to try, I’d love to know how it turns out. Thanks! am I able to prep this ahead of time? Batter the shrimp but leave it in the fridge for a couple hours before frying? No, if you’re looking to save some time by prepping ahead I would suggest dipping the shrimp in the buttermilk and leaving it in the fridge. Hope this helps. On a whim, I decided to make Bang Bang Shrimp tonight, so found yours on Pinterest. Took a short while and they were great! I happened to have the same chili sauce, but I added alot of Sriracha sauce. Next time I will reduce mayo (Hellmans) and increase Sriracha. My husband loved it, so thank you so much. I’m so glad you both loved it! Thanks for the 5 stars! Made this without buttermilk. I actually did a squeeze of orange juice (was going to use lemon but didn’t have that either) and salt before coating with cornstarch. Turned out really good. Thanks for the 5 stars, Anna! Thanks for the substitution suggestion. I made this recipe and it was excellent. Identical to Bonefish Grill. I did end up adding just a touch more sriracha and also a bit of gochujang, for depth, to the sauce. This will be in our rotation! Thanks for the recipe. What is the brand of chili sauce? Here is the link to the sauce. This is the best copy cat recipe I’ve ever run across! Made it several times and it ROCKS with flavor and crispness. Delicious! Thank you! Thanks Pate! I really appreciate the 5 stars! I just made this amazing recipe tonight! I feel like a gourmet chef! Melt in your mouth, better flavor and crispy texture than the Bonefish Grill! Thank you for sharing this wonderful recipe! 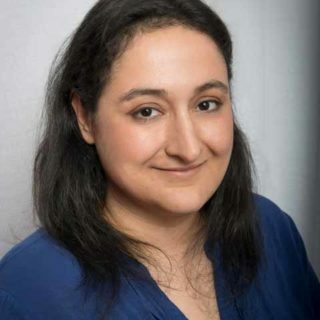 You’re welcome, Amyre! Thanks for the 5 stars! Amazing! Just like the restaurant! Very easy to make! Thanks for sharing this recipe?? Hello! May I substitute xantham gum for cornstarch? I eat Keto and want to make this but would prefer to use xantham I’d possible. Thanks! I haven’t tested so I’m not sure but if you decide to try, I’d love to know how it turns out! Thanks!